Judd Apatow, as both director (The 40=Year Old Virgin, Knocked Up) and producer (Bridesmaids, Superbad, Pineapple Express, TV’s new Girls) has brought a tremendous amount of first-class comedy to large and small screens in recent years. 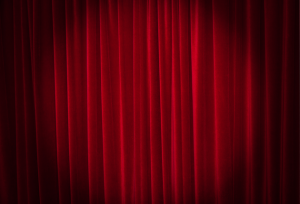 But he also bears some responsibility for a sometimes painful trend: the lengthy comedy. Virgin, Superbad, Pineapple, and Forgetting Sarah Marshall all topped 110 minutes, Knocked Up and Bridesmaids were over 2 hours, and Apatow’s Funny People staggered on its way to an epic 146 minutes. Some of those pictures justified their length, but trying to sustain laughter and charm for that long is risky: there’s reason why Woody Allen, in a career that’s lasted over 40 years and as many movies, has only exceeded 2 hours with a drama (Match Play). And so we have the Apatow-produced THE FIVE-YEAR ENGAGEMENT, a 124-minute comedy that’s likable and sometimes very funny, and also too damn long. 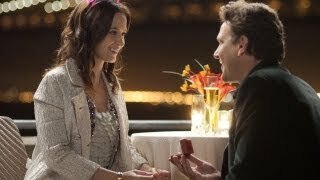 The title tells the basic story: Tom (Jason Segel, also co-writer of the script with director Nicholas Stoller) and Violet (Emily Blunt) are, respectively, an up-and-coming chef and a graduate psychology student, who meet, live, and fall in love in San Francisco, where they become engaged. The plan is for a quick wedding, but of course events get in the way. To the credit of Segel and Stoller, those events are mostly kept human-scale: the biggest is that Violet is only able to get a fellowship in Michigan, and so the pair move there, to Tom’s increasing frustration and misery. The Michigan section of the story occupies most of the movie’s running time, and it’s here that Engagement bogs down. It’s clear within the first few minutes of the couple’s arrival in town that Tom (who somewhat implausibly can only get a job making sandwiches at a deli) will be dissatisfied there, and that future plot developments will feature Violet’s professor Winton Childs (Rhys Ifans), who’s just waiting to pounce on her. Reel after reel of Tom’s increasingly cartoonish depression follow (he becomes obsessed with hunting, guided by neighbor Chris Parnell), and the movie threatens to become as tiresome as the couple fears their relationship is starting to get. Luckily for all, the characters and their tale get a change of location in the last act. Engagement never becomes actively dull, thanks to the charm of Segel and Blunt (although watching the 2 of them together, one sometimes misses her more dynamic chemistry with Matt Damon in the otherwise woeful The Adjustment Bureau) and a terrific supporting cast. Splendid people keep showing up, like Alison Brie (as Blunt’s sister, complete with English accent), Chris Pratt (Tom’s best friend in San Francisco), Brian Posehn (a Michigan co-worker), and the quartet of David Paymer, Mimi Kennedy, Jacki Weaver and Jim Piddock (the in-laws to be). Stoller, who previously collaborated with Segel on Sarah Marshall and The Muppets, has a fine feel for romance, and also for some of the low physical comedy that ensues. If The Five-Year Engagement had been a little less indulgent with the detail it allows itself in the story’s most predictable portion (the editing is credited to William Kerr and Peck Prior, but those kinds of creative decisions are made at a higher level), it could have been a dynamite romantic comedy. The version released is fine, but if it were a book, you might find yourself skipping ahead a few pages from time to time. Unless, of course, the overlength is meant as a postmodern commentary on the impatience and predicament of its characters, in which case: mission accomplished.